Communication and Conflict - further information about this website. Effective interpersonal communication and conflict resolution skills are strongly interlinked. The field of mediation in which I work promotes the development and practice of effective communication in order to achieve conflict resolution. These are the 'bread and butter' of what we do. ...to bring about more effective communication. The website draws upon the experiences of mediation, a process and practice designed to promote creativity by, and effective communication and conflict resolution between people who are in dispute, in order to assist them in improving their situation. When resolution is created by the people involved it is far more sustainable and far more satisfying than an imposed solution from an outside body or even a solution created by an intervening ‘specialist’. You may agree with this statement already, but even if you have your doubts, I think that this website will show many reasons why I say this so categorically. Conflict is an inevitable part of life arising from difference. What matters is not the conflict itself but how we respond to it and whether that response is constructive and resolving or destructive and escalating. This applies whether the initial conflict is our own, or whether we are trying to assist others who are in conflict. We frequently deal with conflict constructively without realising it, but when the response to conflict has become destructive, Mediation seeks to promote a return to constructive responses to it, and learnings from this process are described on this Communication and Conflict related website in order to spread these insights to a wider number of people. A breakdown in communication in any situation can lead to destructive responses to conflict. I make this distinction between constructive and destructive responses because we don’t often congratulate ourselves for our constructive responses and acknowledge what we have learned from them. Conflict gets a bad name because of the fact that when it is responded to destructively we notice the behavioural response and call that the conflict. I might disagree with you over whether a motorway should be built, and that disagreement is a conflict, but I can engage in discussion with you about it or I can throw stones at you and send hate mail to your office. The conflict remains the same, but my response to it can be constructive or destructive. In fact, conflict as an event is an opportunity for learning and for developing greater rapport with others. But we often hear people say that they have a fear of conflict and do anything to ‘avoid’ it. We are responsible for whether it leads to learning and greater closeness and rapport or whether it leads to war. All the time we say the conflict is the problem it means we are not taking responsibility for our responses to it. We are not acknowledging our ability to respond constructively - our response-ability in the face of conflict. Recognition of our capacity to create more effective responses enables us to lose our fear of conflict or need to avoid it. Many of us never consider that there may be a better way of responding to our conflicts and so we become reliant on others to 'change'. This is a hopeless aim. Instead we can learn to embrace conflict and treat it as an opportunity for growth, learning, greater rapport with others. Conflict can become a doorway to enrichment of our lives. This website can help you recognise that capacity and gain the benefits of embracing conflict. This website will help you to understand why conflict avoidance techniques don't work and will enable you to practise effective communication and conflict resolution approaches which do work. These approaches to conflict resolution work because they support the person or people experiencing destructive conflict in understanding how they think and feel about their conflict. This enables them to see that they have the ability to respond effectively - they have response-ability so they can take responsibility. Approaches to conflict which focus on techniques for controlling others or telling them what to do do not work, even if they seem to in the short term. These approaches presume, often unconsciously, that those involved in destructive conflict do not have the ability, nor the willingness, to respond effectively. This means that their empowerment is not supported through these approaches to take responsibility, to practice their ability to respond. Ultimately, no conflict is ever resolved without those in conflict taking responsibility or ownership of their responses, be they words or actions, however challenging that may be. This website shows you ways in which effective communication and conflict resolution can be supported, through awareness of practices which support the empowerment of those responding destructively to conflict to create more effective responses. It will also identify common ways in which those involved often feel disempowered, simply through ineffective communication, and through approaches taken by those trying to help. Such approaches are manifestations of Rescuer Syndrome. This is not only ineffective in helping to resolve conflict, it usually escalates the destructiveness of it. The Principles of Effective Communication identify ways in which people are empowered through communication. Conflict Resolution and The Underlying Philosophies of Mediation show the means through which resolution of conflict can be supported and the thinking behind it. TRAINING Are you looking for Training in Effective Communication, or Conflict Management - for yourself, or for an organisation? 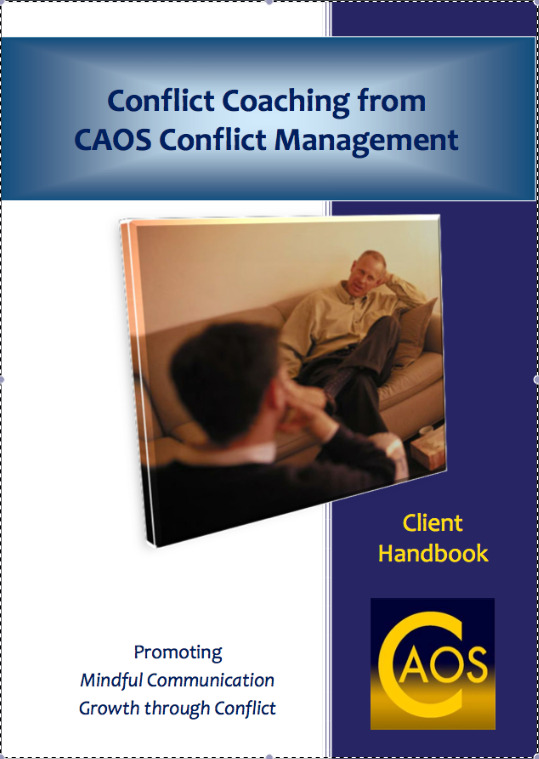 Do you have a more specific training need in relation to Communication and Conflict Resolution? If so, Click here to go to the Training Page. .....so that we can reflect upon how the communication went and whether there might be a more effective way, using the Principles as pointers to different ways of responding or acting in the situation. It’s very much an experiential learning process, meaning that we can use them to continually develop our awareness of and practice of Effective Communication, using our experiences of responding to conflict to reflect on. Whether the responses worked well or failed miserably. Whether they are our responses or responses we have observed in others. All of them provide opportunities for reflection and learning in order to improve the effectiveness of our communication, and the Principles of Effective Communication and the skills used in Conflict Resolution, and the Underlying Philosophies of Mediation offer support in doing this. Would you like your own website?